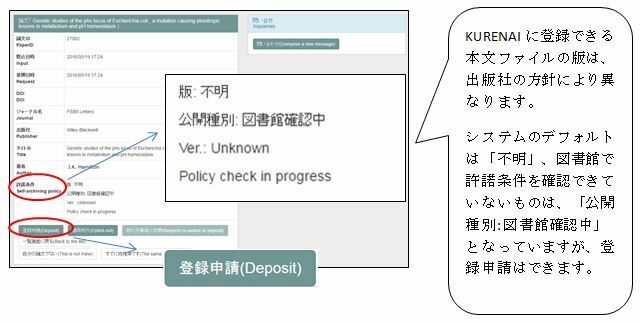 The KURENAI Deposit System has been created to promote depositing articles covered by "Kyoto University Open Access Policy". The system uses Scopus data and researchmap data. 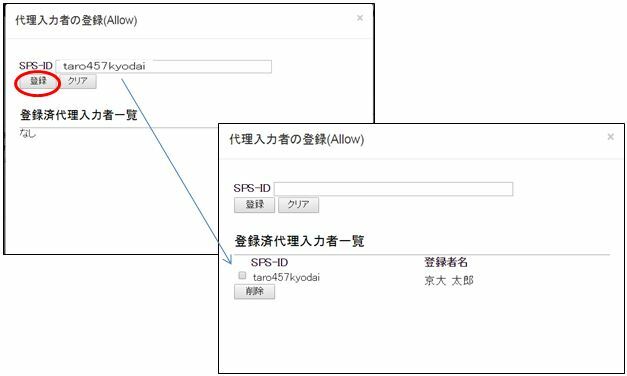 This system is available to Kyoto university faculty and staff with SPS-ID. If you don't have SPS-ID or the system does not work, please send Registration Form and Data files of your article by mail. 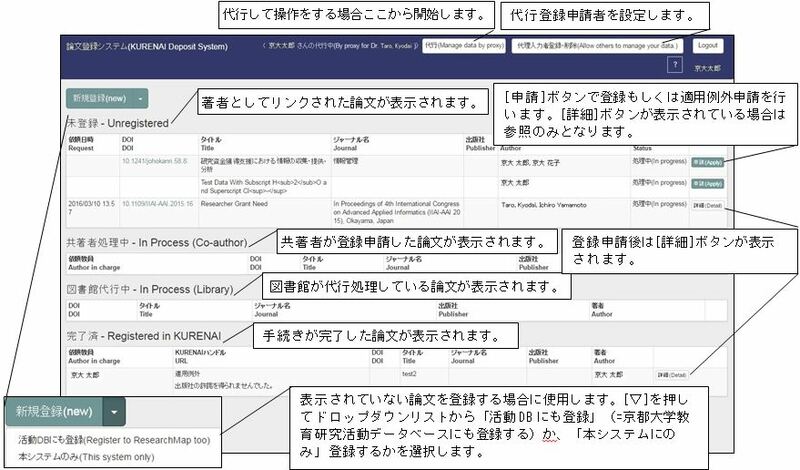 京都大学学術情報リポジトリKURENAI Kyoto University Research Information Repository "KURENAI"
リポジトリ登録システムマニュアル KURENAI Deposit System manual　→PDF ver. - Published version; the Library will retrieve the published version from the publisher's website. 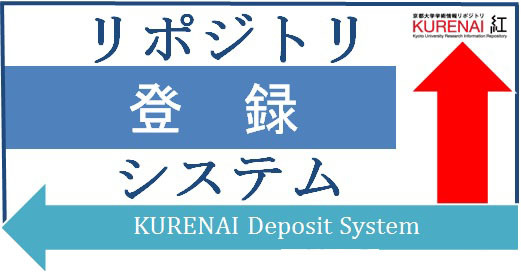 リポジトリ登録システムにログインします。Log in to the KURENAI deposit system. 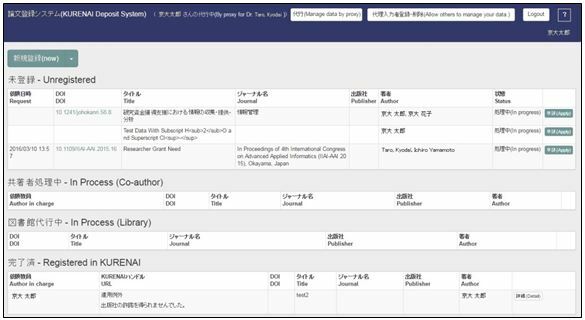 Go to https://openaccess.kulib.kyoto-u.ac.jp/researcher/ and login via Shibboleth with your SPS-ID and password. A procedure depends on whether an article data exists or not in the list. ① 一覧画面の「未登録」論文の最右列にある[申請] ボタンをクリックして論文詳細画面を開きます。 To open Detail window, click the [Apply] button. ② [許諾条件]項目で、登録できる版を確認してから、[登録申請]ボタンをクリックして送信画面を開きます。 Confirm the version in "Self-archiving policy", then click the [Deposit] button to open application screen. If the version in "Self-archiving policy" is "Accepted Author Manuscript", please attach files. If "Self-archiving policy" is "Published journal article", You do not need to send the data file limited to when the Library can retrieve the publisher version from the publisher's website. Check the box of "I have obtained agreements to deposit the paper in the repository from all the co-authors" and click the [Send] button. 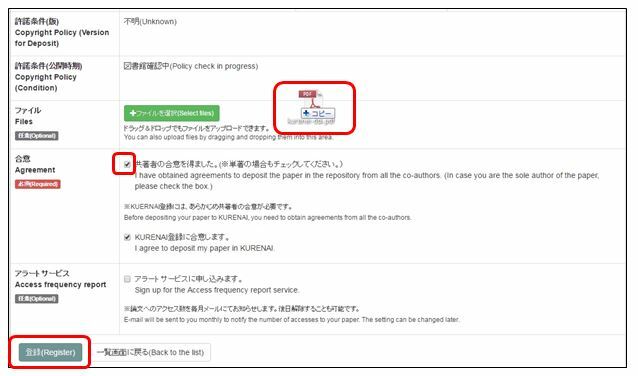 *Before depositing your article to KURENAI, you need to obtain agreements from all the co-authors. Even when you are the sole author of the article, please check the box. After returning to Detail window, the message "Your application has been sent" appears. To return to List window, click the [Back to the list] button. ⑤ 一覧画面に戻ると登録申請した論文の最右列には、[申請]ボタンの代わりに[詳細]ボタンが表示されます。[Dedail] button is displayed replacing the [Apply] button on the right side of the data. リポジトリ登録システムに、登録したい論文のデータがない場合、データを新規に入力して登録申請できます。If a data doesn't exists in the list, please create a data. ① 一覧画面の[新規登録]の▽ボタンをクリックして、「本システムのみ」を選択します。Click the [▽] button at the right of the [(new)] button, select [This system only]. 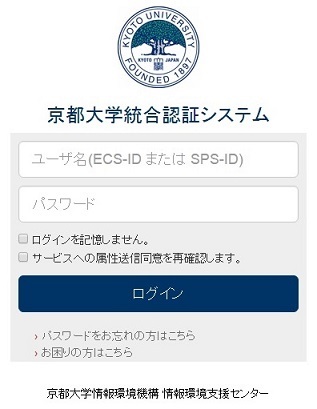 ② 新規論文登録画面に遷移するので、各項目を入力します。Please enter information on the registration screen. ③ [登録]ボタンをクリックします。 Click the [Register] button at the bottom of the screen. ④ 一覧画面に遷移し、未登録一覧に登録した論文が表示されます。論文の最右列には、登録申請後に表示される[詳細]ボタンが表示されます。The data is displayed on the List window. 京都大学教育研究活動データベース（以下、活動DB）にも論文データを登録する場合に、この機能を使用します。You can use this fanction to register a data on the Activity Database on Education and Research, Kyoto University ("KatsudoDB") and this system. ① [新規登録(NEW)]ボタンの▽をクリックして「活動DBにも登録」を選択します。Click ▽button of the [NEW] button and select [Register to ResearchMap too]. 自動的に移動しない場合は，ここをクリック してください．」 (the notice of screen transition) will be displayed. 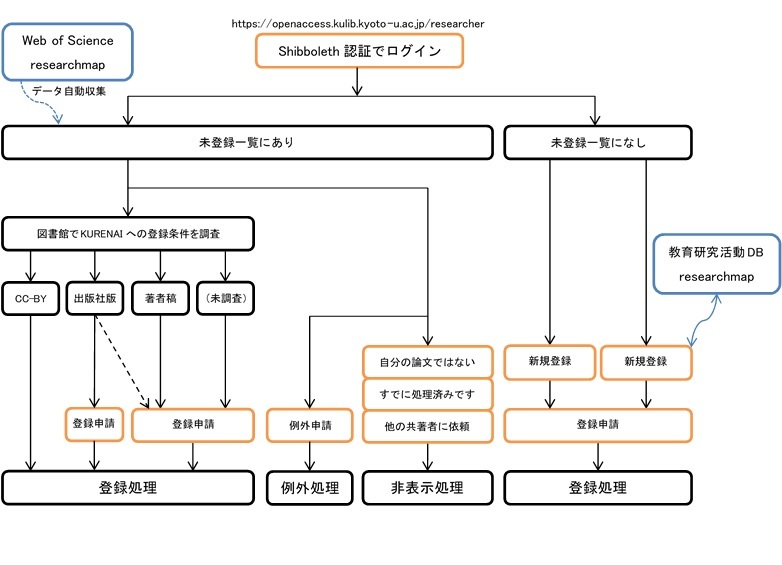 ③ Shibboleth認証で既にログインしている場合は活動DBの編集画面が開きます。代行登録の場合は、代行する教員を[選択]ボタンで選択します。When you are already logged in, the edit screen of KatsudoDB will appear. In case of an agent registration, please select [選択]button of your researcher. Register the article data in KatsudoDB according to the its manual below. 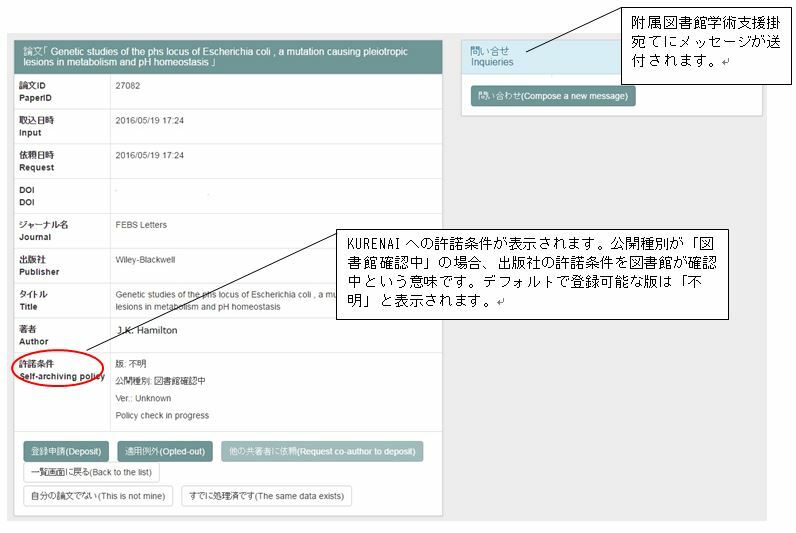 After updating the data of KatsudoDB, the message of leading to KURENAI in the edit screen will popup if (1)the article is published in 2016 and (2)the article's researchmap classigication is not "Misc" and (3)the article is opened in researchmap. 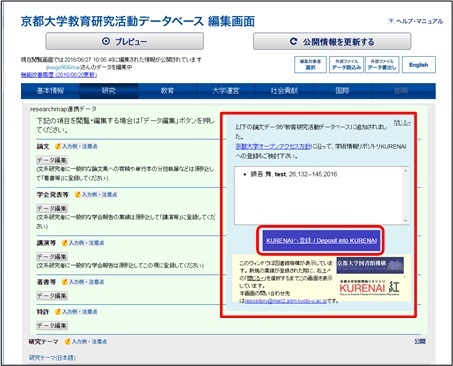 Click [Deposit into KURENAI] button. 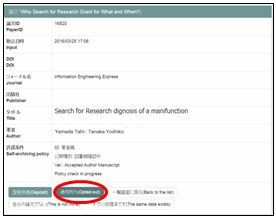 When the top screen opens, the article data registered in researchmap will be displayed in the Unregistered list. Apply it according to Use Data in "Unregistered" list. 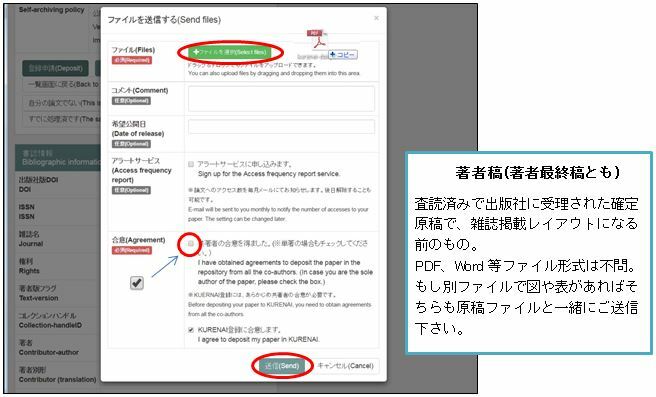 You can opt out when co-authors or publishers disagree on depositing the article in KURENAI. Embargo is not an excuse to opt out. Click the [Apply] button in the Unregistered list to open Detail window. Click the [Opted-out] button to open application window. After selecting the reason of opting out, click the [Opted-out] button. Then List window appears again. After you return back to the Detail window, the opted-out article is displayed in the "Registered in KURENAI" list. 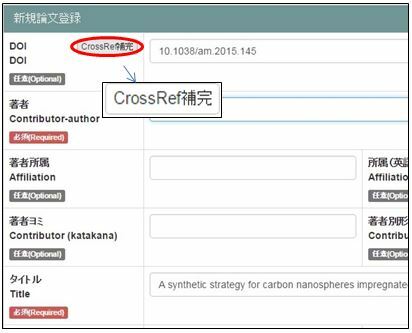 It is a function to make the article non-displayed in the Unregistered list. When another person's articles are displayed, you can click this button is to remove the article from the Unregistered list. Click the [This is not mine] button. The below window pops up, then click the [OK] button. After you return back to the List Window, the message "The item has been deleted from your list" appears. Then the article is not displayed in the Unregistered list. 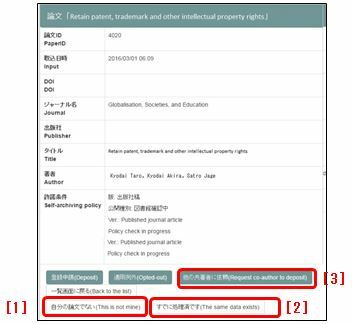 This button is to delete the article from the Unregistered list when the same data is displayed or has already been registered in KURENAI. Click [The same data exists] button. The below window will pop up, then click the [はい] button. After you return back to the List Window, the message "Apply for a duplicate" will appear. Then the article will not display in the Unregistered list.